With Independence day on Wednesday, this week’s Sunday Supper is appropriately themed “4th of July cookout fun! Could be favorite foods on the grill, salads or desserts.” While my cheese-stuffed burgers would make the perfect entree, I could easily eat an entire platter of roasted asparagus and by just as happy. As I’ve said time and again, roasting is one of my favorite methods for cooking vegetables as it brings out beautiful flavor in them. As usual, I prefer simplicity: just some olive oil, lemon juice, salt, and pepper. Once they’re done, sprinkle on some freshly grated parmesan and you have yourself an incredible side for just about any meal. I usually roast them, but they are beautiful on the grill as well and make an awesome addition to any barbecue. This 4th of July I won’t be barbecuing, but I will be at Coney Island going to the beach, watching a Cyclones minor league baseball game, enjoying fireworks, drinking beer and eating hot dogs – sounds like a pretty all-American day to me! What are you up to this Independence Day? Recipes don't get much simpler than this one! And it's gluten free, vegetarian and, if the cheese is omitted, vegan! Preheat the oven to 350F or preheat your grill. 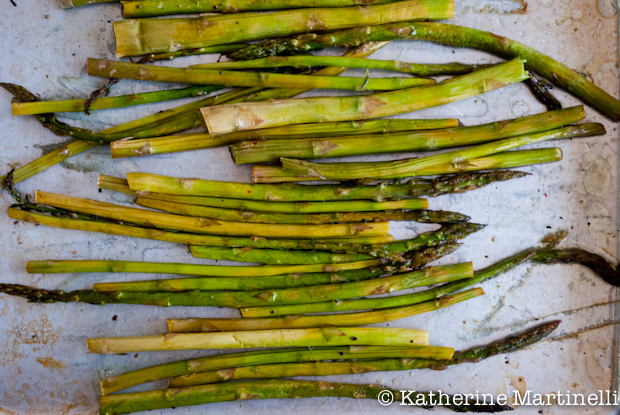 Put the asparagus on a baking sheet and toss with the olive oil, lemon juice, salt, and pepper. Put the pan in the oven or put the asparagus spears directly on the hot grill. If cooking in the oven, roast for 15 to 20 minutes, or until nicely browned and tender. If grilling, cook for 5 to 10 minutes, until slightly charred and tender. Remove from the oven or grill and top with a light sprinkling of grated parmesan cheese, if you wish. Serve with additional lemon wedges. All of the awesome #SundaySupper participants will be sharing their featured recipes all afternoon on Twitter, Facebook, Pinterest and Instagram. Then we will have a live chat at 5:30 EST on Twitter. Use the hashtag #SundaySupper and come have some fun. We look forward to answering questions, giving tips and inspiring you to spend more time Around the Family Table with those you love! Asparagus makes me a happy lady! This sounds awesome! Roasting makes any vegetable so flavorful! The touch of parmesan cheese sounds so good. Have a good week! This is my favourite veggie! I wish it’s available all year round. Your roasted asparagus looks simply delectable. This is my fave way to enjoy asparagus! I loved grilled asparagus!! I think I will add some to tonights dinner! Thanks for the inspiration! This is exactly how I serve my asparagus! It’s been a while since I’ve served any! You’ve made me want it again! i just love asparagus like this! looks so delicious! I love to roast my asparagus! It’s so much tastier than plain old steamed! This is one of my all time favorite sides!! I could eat it every day! Great minds think alike! I was just planning on grilled vegetables as a side for our summer outdoor dinners. A week full of house guests requires a little planning and freshly grilled veggies are on my list! Now for a main course! Any suggestions? A gorgeous plate of asparagus! We love to grill it but Bobby has a challenge in keeping spears from falling through the grate. 🙂 The addition of the Parmesan as the topping sounds quite good! Great addition to Sunday Supper! I love roasted asparagus! (actually anything asparagus) I like grilling it too but I have to be very careful because I’ve “over grilled” a time or two. Roasted (or grilled) asparagus is just awesome stuff. Good job! And being at Coney Island on the 4th is about as American as it gets in my book! I love nothing better than blasted asparagus…thanks for making them legit!!! I’m always up for trying Asparagus a different way and why not cheese! LOVE IT!! So simple, but so delicious! Love it. Roasted or grilled asparagus is my favorite side dish. It’s just one of those classic dishes that goes well with anything accompanying it. Your dish looks delicious. Roasting is my favorite way to prepare asparagus — it’s flavor is perfect in its simplicity! Gorgeous too. Looks like a fantastic round-up! Hi Katherine! I can’t think of a better way to enjoy asparagus! 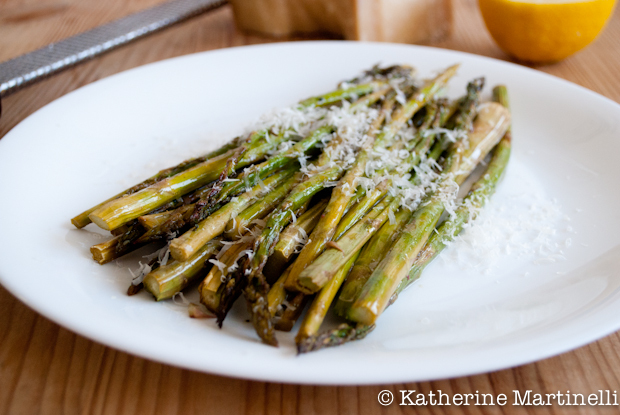 Grilled asparagus is perfection and a little salty Parmesan is the perfect way to finish it off! Congratulationsa on making the foodbuzz Top 9! Congrats on Top 9 Katherine! 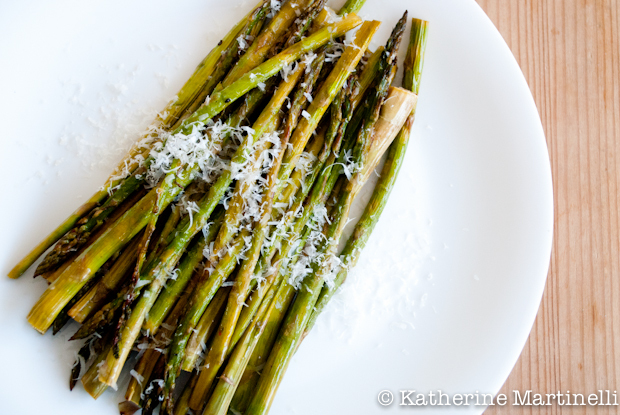 I love both grilled or roasted asparagus but never cooked with Parmesan cheese. Going to try this on my very next asparagus! I love asparagus. Roasted, grilled, either way. Sounds like you’re visiting the states for the holiday. Have a great time! oh I love this recipe! It’s so simple and healthy!! Will definitely try it the next time I get some yummy asparagus! Thank you so much!! Katherine this looks so good. I love asparagus and this just looks like perfection. Grilled asparagus is one of my absolute favorite sides in the summer–I usually do the lemon juice on the side as part of a vinaigrette, but will try your method.